The KHTS Emergency Expo, which will only take place on Saturday April 27th, 2019 from 10 AM to 5 PM and is sponsored by Facey Medical Group, and is presented in conjunction with the 10th Annual KHTS FM 98.1 & AM 1220 Santa Clarita Home and Garden Show. The Emergency Expo will have displays, presentations, and drills from Santa Clarita emergency response teams. You will also have the opportunity to see exhibitors with products and services for emergency preparedness and response and recovery. Imagine climbing on-board a fire truck, hitting the siren on a sheriff patrol car, watching a demonstration of the “Jaws of Life,” by the Los Angeles County Fire Department. 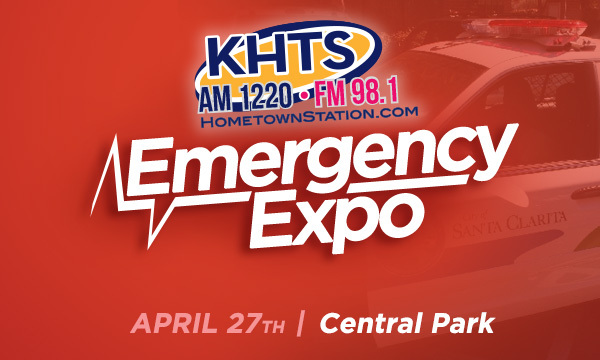 The KHTS Emergency Expo will be happening all day Saturday at Central Park in Santa Clarita, connected to the Home and Garden Show. There’ll be many exciting demonstrations from the Los Angeles County Fire Department, Henry Mayo Newhall Memorial Hospital, California Highway Patrol, the Santa Clarita Sheriffs, the City of Santa Clarita and more emergency and safety businesses and organizations. Kids can experience the Shakey Quakey House, simulating an earthquake inside a mobile classroom courtesy of the Los Angeles County Fire Department. See Search & Rescue animals, horses and watch us destroy a vehicle in a simulation of the Los Angeles County Fire Department’s Jaws of Life rescue. Show times for the KHTS Home and Garden Show are Saturday, April 27, from 10 AM – 5 PM and Sunday, April 28 from 10 AM – 4 PM. Note the Emergency Expo is Saturday ONLY, however many Emergency vendors will also be displaying and selling their products and services on Sunday, as well.